The FDA Alert(s) below may be specifically about Esidrix or relate to a group or class of drugs which include Esidrix (hydrochlorothiazide). 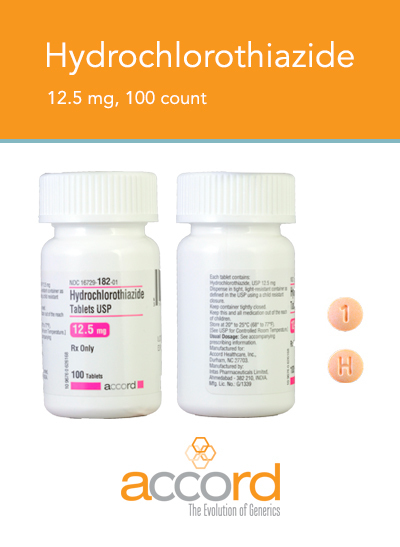 Accord’s Hydrochlorothiazide Tablets USP 12.5 mg are light orange to peach colored, round, biconvex tablets debossed with H on one side and 1 on another side. An image of this product is available here. ISSUE: Unichem Pharmaceuticals (USA), Inc. (Unichem) is voluntarily recalling one lot of Hydrochlorothiazide Tablets 25 mg 1000-count bottle to the consumer level. This recall has been initiated as a precautionary measure due to the identification of a Clopidogrel tablet found in a bottle of the product. The risk associated with mistakenly taking a Clopidogrel tablet instead of a Hydrochlorothiazide tablet is the increased probability of experiencing Clopidogrel's side effects which include bleeding and/or bruising. Patients with active bleeding or who are allergic to Clopidogrel or any component of the formulation may experience more serious adverse health consequences as a result of unknowingly consuming Clopidogrel. Additionally, missing a dose of Hydrochlorothiazide could result in uncontrolled blood pressure or swelling caused by excess fluid (edema). BACKGROUND: Hydrochlorothiazide tablets are indicated for the management of high blood pressure and edema and are packaged in 1000-count bottles. The affected Hydrochlorothiazide tablets include Lot # GHYL15028 - Expiration April, 2018, and was distributed nationwide directly to wholesalers, retailers, and pharmacies from May 21 - 28, 2015. As per Unichem's internal investigation, this episode is an isolated event noted at one pharmacy and confined to the recalled lot. Unichem has not received any reports of adverse events related to this recall to date. RECOMMENDATION: Consumers should not consume Hydrochlorothiazide Tablets 25 mg 1000's from the lot GHYL15028 which is being recalled and should return to place of purchase. Consumers should contact their physician or healthcare provider if they have experienced any problems that may be related to taking or using this drug product. If the consumer is not sure they received the recalled lot, they should contact the pharmacy that dispensed the product to them. Unichem is notifying its distributors and customers by letter, overnight FedEx and emails. Unichem is also arranging for return of all recalled products.